Multiple sclerosis (MS) is a multi-factorial disease associated with chronic autoimmune inflammation of the central nervous system (CNS). 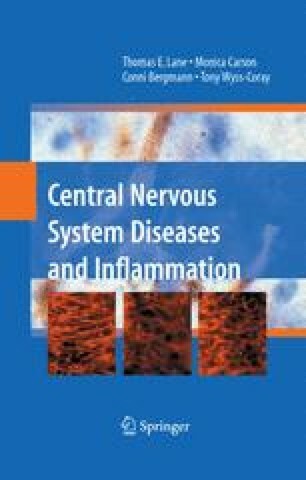 In MS, and the relevant animals models experimental autoimmune encephalomyelitis (EAE), and Theiler's murine encephalitis virus-induced demyelinating disease (TMEV-IDD), myelin destruction is mediated by neuroantigen-specific CD4+ T cells (Gonatas et al., 1986; Miller et al., 1997; Wekerle, 1991). MS and EAE share clinical and histopathological similarities. Mononuclear cells (MNCs) accumulate in demyelinated lesions in the white and grey matter of the brain and spinal cord. Infiltrates are composed of CD4+ and CD8+ T cells, B cells, macrophages and dendritic cells (DCs). CD4+ T cells and DCs are critical for the initiation and progression of EAE as CD4+ T cell depletion renders mice resistant to EAE (Jameson et al., 1994; McDevitt et al., 1987; Sedgwick and Mason, 1986; Waldor et al., 1985), and DCs from the CNS uniquely activate naïve myelin-specific T cells by acquiring and processing endogenous myelin peptides (Bailey et al., 2007). The initiating events in MS are unknown, but studies in the EAE and TMEV-IDD animal models indicate that CNS damage is caused by direct and indirect effects of inflammatory cytokines and chemokines (e.g. TNF, IFN-γ, IL-17, CCL2, etc.) (Begolka et al., 1998; Chen et al., 2006; Karpus et al., 1995; Powell et al., 1990), that induce the activation and recruitment of monocyte/macrophages and resident microglia, that cause axon damage and demyelination by bystander mechanisms (Cammer et al., 1978; Rivers and Schwentker, 1935).